about this book: Writing Boots to Loafers, Finding Your New True North (aka Boots) has been a 3-year labor of love. I retired from the US Army in 1999. There was little to no transition assistance when it came time to learn what I needed to know when I transitioned out of the military. Over the course of a few years, I start compiling certain aspects of working in corporate America that were different than what I experienced while in the military...this was the genesis of Boots. Simply put, Boots is THE new field manual for all military that are planning to leave the service or retire. 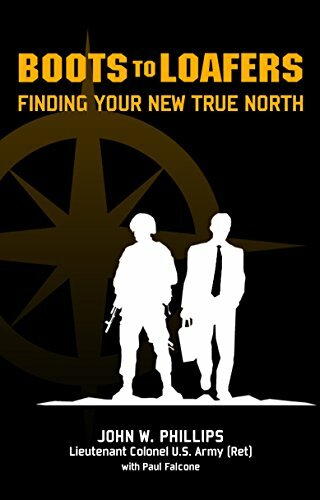 This book is also for all veterans that have already made the transition and are having a difficult time trying to figure out what they need to do to be prepared to join the workforce in their new life "outside the gate". The book is broken into three sections…Transition, Transformation, and Integration. Anyone transitioning out of the military will go through these phases. Topics such as types of interviews, preparation for interviews, how to dress, communications, leadership, the concept of rebranding yourself, corporate culture, leadership, home life after the military, the very confusing world of benefits and much more are covered in the book. Get your copy of Boots today at www.bootstoloafers.com and capitalize on my lessons learned. HOOAH! !